• Prison Ministry – Now in 10 prisons and adding new ones each year. • Evangelists – Currently support 35 evangelists from two synods. • Bible Schools – Currently support three Bible Schools: Manasoa –Betioky Synod; Mananovy – Betroka Synod; and Manatantely–Faradofay Synod. • Tandroy Bible Translation and Printing Project – Awaiting approval to print this labor of faith for the past 16 years, translating the Bible into the Tandroy dialect. • Drip Irrigation Project – A new program beginning in 2017 to teach people in the arid southwest part of Madagascar (in the Ejeda Hospital area) how to provide for their food supply during the droughts. One hundred percent of a contribution goes to the mission project selected, with nothing taken out of the gift for administrative costs. 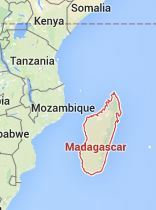 The gift is sent quickly to the selected mission project in Madagascar. Contributions may be designated separately to apply toward FOMM’s administrative costs. Contributions come from individuals, congregations, grants, wills and endowment earnings.